This book is a work of fiction. All characters, names, locations, and events portrayed in this book are fictional or used in an imaginary manner to entertain, and any resemblance to any real people, situations, or incidents is purely coincidental. “Perdita” by Anthony Frederick Sandys (1829-1904); “Street in Venice” by John Singer Sargent, 1882; “Swinton Park Tree by Night” by Andy Beecroft (geograph.org.uk), January 14, 2007; “Tree silhouetted in radiation fog” by Andy Waddington (geograph.org.uk), November 22, 2005; “Star-Forming Region LH 95 in the Large Magellanic Cloud,” Credit: NASA, ESA, and the Hubble Heritage Team (STScI/AURA)-ESA/Hubble Collaboration, Acknowledgment: D. Gouliermis (Max Planck Institute for Astronomy, Heidelberg). “Map of the Realm and the Domain,” Copyright © 2013 by Vera Nazarian. Don’t miss another book by Vera Nazarian! by Vera Nazarian are available. We promise not to spam you or chit-chat, and only make occasional book release announcements. For all those who have gone before . 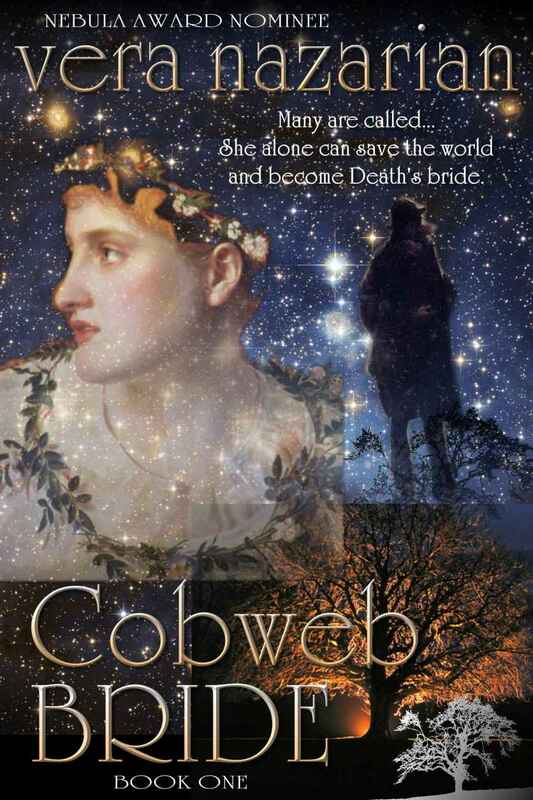 . .
e came to them in the heart of winter, asking for his Cobweb Bride. He arrived everywhere, all at once. In one singular moment, he was seen, heard, felt, remembered. Some inhaled his decaying scent. Others bitterly tasted him. ut Death’s human story began in Lethe, one of the three kingdoms of the Imperial Realm. It was evening, and the city of Letheburg reposed in amber lantern lights and thickening blue shadows. At some point there had been a silence, a break in the howling of the wind, as the snow started to fall. Flakes of white glimmered through the frost-blurred glass of the myriad windows of the Winter Palace of Lethe. In moments the snowflakes turned into armies. They piled and compounded, stretched and distended into geometric symmetry. Folding into garlands of impossible gauze veils, they appeared at last to be the faint and vaporous spinnings of a sky-sized ice spider casting its web upon the world. While the pallor and the darkness grew outside, Death was arriving within—inside a bedchamber permeated with illness, the boudoir of the old Queen. formed out of the cobwebs of the gilded crown molding near the ceiling, the dust motes of desolation, and the fallen shadows in the corner. All these tiny bits and pieces of the mortal world rushed together to shape him. He began as grey smoke. Then, darkness deeper than soot. His form solidified into a man, gaunt and tall, clad in black velvet like a grim Spaniard. He wore no cape, but somehow his face was hooded, as though a veil rippled between him and anyone who might look. The first to notice him was the woman sitting in a chair at the foot of the great bed, farthest away from the fireplace—a regal middle-aged woman in a heavy brocade dress of deep green. She saw him and gasped, forgetting her stoic demeanor. At the woman’s reaction, the distinguished man with silver at his temples, standing next to her—leaning as he had been, for hours it seemed, over the bed and its decrepit occupant—turned to look. And he was taken with paralysis, able only to stare. Finally, the fading old creature who lay in the bed—ethereal as a desiccated fairy, sunken in layers of soft winter mahogany fleece and cream silk—turned her clouded gaze in the direction of the presence. But the old woman lying in bed merely rattled the air in her throat and lifted a gnarled trembling finger, pointing. There was profound relief in that gesture, a final offering of the self. But the one who stood before her—before them all—did not respond. Moments gathered around him like the fluttering yet unfailing pulse-beat in the old woman’s throat. And then, at long last, he spoke. With a clanging of metal, guards came running into the chamber. But they too seemed to lose urgency, and lined up at the doors watching with transfixed faces. “Who are you?” the woman in green tried again. Underneath her formally coiffed hair, the color of dark tea, bright drops of faceted yellow topaz sparkled in her earlobes, reflecting the flames. Tiny pearls sat in the intricacy of her collar lace. But her voice was dull, without inflection, for she knew very well who it was. “Death stands before you,” he replied with a softness of the final breath. “Have you come to take from us Her Majesty, my Mother and our Queen?” whispered the man who had summoned the guards. He wore expensive velvet garments of deep mourning and had a stern face framed by dark hair with its beginnings of grizzle, undisguised by a powdered wig. There was no need for ceremonial formalities in this bedchamber—at least not today. “What does that mean?” said Roland Osenni—he who was indeed a Prince of Lethe, and who would have been King in the next three breaths had they been the old Queen’s last. Meanwhile, the old Queen, Andrelise Osenni of Lethe, let her hand drop on the coverlet. Skeletal fingers twitching, she lay gurgling, drowning in her own spittle, the death rattle in her throat an unrelenting rhythmic sound. “Oh God, have mercy!” Princess Lucia stood up in reflex at the awful new sound, and came forward to stare at the dying Queen, wringing her own hands clad with heavy gold rings. She clenched her fingers so hard that the metal and jewels cut into her flesh. Pain shot through her, clean and sharp. Pain, cleansing the mind. But there was to be no clarity and no death that night. And as the voice faded into echoes of cold stone, so did the form of shadows and black soot, until only mortals were left in the room. Did they imagine it? Had it been a flicker of the mind, a waking dream? The crackling flame in the fireplace cast a golden-red glow upon them all. And the old Queen’s death rattle continued. eath’s second stop was simultaneous, yet many leagues away, to the north. Evening twilight encroached with blue and indigo upon the whiteness of the frozen Lake Merlait. It was a scene of slowing battle between the forces of Duke Ian Chidair, known as Hoarfrost, and the armies of his neighbor, the Duke Vitalio Goraque. Neither side as yet had the upper hand. Winter wind howled in fury while heavy cavalrymen and horses struggled in a slow melee, immense metal-clad knights bringing broadswords and maces down upon each other, to cleave and bludgeon. Joined with the screaming wind in a discord were the clangor of iron and shouts and groans of agony as the wounded and the slain soldiers piled upon the whiteness. Footmen slipped and moved between the feet of the great warhorses, and long pikes pierced chain mail and mail plate, butting up against the ice. There were places where the ice had cracked. Here, men and beasts had fallen through into the gaping blackness, the sludge water thick and slow underneath the ice. The dead and the living had intermingled, and common blood stained the top layer of the ice with dark red; pale rose in places, deep as burgundy in others. Then, all of a sudden, the wind died. Except for the ringing metal and human cries, there had come silence. One beheaded soldier continued to move. His severed head together with its helmet, eyes still blinking, mouth distended into a cry, rolled into the gaping hole in the ice, sinking into the breach. But the headless torso, now blind and staggering, continued to wield the sword, and to swing it wildly. Behind him, another soldier, wearing red and gold, Duke Vitalio Goraque’s colors, was pierced through the heart with a long pike. Instead of collapsing, he froze in place for several long shuddering moments. Then, as the one who struck him down stared in disbelief, the soldier took hold of the shaft and pulled it out of his own chest, shouting in agony. And he continued to fight, while blood darker than his tunic poured out of his wound in a spurting fountain. it, for the burden of his plate armor weighted him down as though he were an anvil. The knight sank, screaming, while the sludge blackwater closed over his head, seeping into his under-tunic and all the crevices with a shock of excruciating cold. And he continued screaming silently with all the force of his lungs that collapsed and then filled with the ice water while he was being consumed by universal agony of cold fire and impossible stifling pressure. All his muscles spasmed, and yet his heart did not shut down instantly from the shock. His heart went on beating, slow and stately like an ice drum, then slowing down gradually, as though unwinding mechanical gears. While his blood—now as cold as the water in the lake—crawled through him sluggishly. And still the knight descended, flailing his limbs in the absolute darkness and cold while his mind chanted a prayer to God for an end that would not come. Eventually he hit the bottom of the lake, thick with mud. He lay there, unable to move from the weight of his armor and from the constricted and frozen muscles of his body; unable to breathe and suffocating without end, yet not losing consciousness. His face, now invisible to any other living being, was clenched in a rictus of horror, and prayers were replaced with madness. Directly above him—no more than fifty feet through the freezing waters, upon the ice crust surrounding the breach through which he had fallen—the battle went on. But it had taken a turn of unreality. Men on both sides continued to strike mortal blows, but their opponents faltered only briefly. Many of the slain picked themselves back up from the ice and continued fighting, even though they were soon drained of all blood. Others stood or lay howling in unrelieved pain from deadly wounds and mutilations, neither losing consciousness nor life. “Sorcery! By God, this is dark witching sorcery! Fall back! Fall back!” Duke Vitalio Goraque cried, thrown into sudden mindless terror by the realization of what was happening around him. It did not matter that he was surrounded by a solid circle of his best knights and henchmen, while behind him rode the loyal pennant bearer, holding aloft the red-and-gold banner with the Goraque crest. It did not matter that they had advanced such a significant distance across the frozen lake, and were more than halfway to the western shore that marked the outer boundary of the lands held by his enemy, Hoarfrost. None of it mattered. The red Duke attempted to fight his way back from the middle of the frozen lake to the eastern shore where his reserve detachments waited. On the other end of the lake, a mere ten or twenty feet from the western shore, flew the pennant of the palest blue, now obscured by evening murk, with the crest of Chidair. Duke Hoarfrost himself, Ian Chidair, sat on his tall grey charger like a rock, while continuing to swing his broadsword at the enemy knights. Next to him fought his son, Lord Beltain Chidair, protecting his father’s formidable back. He moved, deep in a berserker fury, demonic and terrifying. No matter how tired he had to be at this point, few dared to approach the young knight who had never been defeated in combat. The few remaining Chidair knights at their side were dull with exhaustion. None had yet noticed the peculiar consequences of what should have been mortal strikes, attributing it to the enemy’s tenacity—after all, Chidair had been pushed back into retreating to their own shores of the lake. And the cessation of the ice wind against their numb faces was merely perceived as a blessed minor relief. But then they saw in the distance near the heart of the lake that Duke Goraque’s forces seemed to be regrouping and then retreating east. It made no sense. Why was Goraque retreating? He had the upper hand! Though evenly matched in general, the battle had been hardest upon Duke Hoarfrost’s army, especially in these last minutes. The only explanation for the uncalled-for retreat of Duke Goraque’s men was that they must have been deceived by something in the growing dusk. Or maybe they were unwilling to continue the battle at night. “Accursed cowards!” Duke Hoarfrost exclaimed, panting hard. With a great backhanded blow he delivered a killing strike to the neck of the last Goraque knight within sword range before him—a strike that should have severed collarbone and ribs and cleared the immediate area of any remaining opponents. The knight did not fall but slumped forward in the saddle to lie against the neck of his warhorse from the impact of the received blow. Blood spurted down the front of his already ruddy surcoat as his heart pumped the life-liquid out of the damaged body. Within moments he will have drawn his last breath. Himself near collapse, breathing in shuddering gasps of exhaustion, Duke Hoarfrost turned his back to the defeated enemy and addressed the pennant bearer of his House. He never finished. Because in that moment a long dagger was lodged and twisted with surprising force in his lower back near the kidneys, deep to the hilt, in that vulnerable spot right between the mail plates. And a moment later a broadsword point struck him higher, between the ribs, running in through the heart and out the front of his chest cavity. The point of the sword was stopped only by the hard inner surface of the chest plate. Where There's Smoke by Black Inc.